1. Los Altos (9-0) – All that stands in the way of a perfect season is West Covina. And it won’t be easy. 2. Bishop Amat (7-3) – If it didn’t blow that lead to Loyola, would have been 8-2. Regardless, great job by coach Steve Hagerty and Co. Now they’ve got two weeks to wait for a playoff opponent. 3. Northview (8-1) – Will head to the playoffs with a lot of momentum, but has a dangerous game Thursday against Baldwin Park, who just upset San Dimas. 4. Charter Oak (8-1) — As good as Brian Casteel is, he can’t do everything for the injury-riddled offensively challenged Chargers. 5. Damien (6-3) – Spartans can probably wrap up a playoff berth with a victory over Etiwanda. First time in a while they will finish with a winning record. 6. Arroyo (8-1) – Is this the year the Knights finally make a playoff run to go with one of its great regular seasons? 7. West Covina (6-3) – Can shake up the Hacienda League with a victory over undefeated Los Altos. 8. San Dimas (7-2) – Losing to Baldwin Park was the shocker of the season. Not even close. 9. Nogales (8-1 ) – Huge win over Duarte puts the Nobles in position to win the Montview League title with a win over Sierra Vista. 10. South Hills (5-4) – Huskies can clinch share of Palomares with a victory over Ayala. The Rest: 11. Glendora (4-5); 12. South El Monte (8-1), 13. Baldwin Park (5-4), 14. Diamond Ranch (4-5), 14. Covina (6-3), 16. Duarte (6-3), 17. Bonita (3-6), 18. Sierra Vista (6-3), 19. Azusa (4-5), 20. Rowland (4-45), 21. La Puente (6-3), 22. El Monte (6-4), 23. Pomona (4-6), 24. Workman (4-5), 25. Mountain View (3-6), 26. Diamond Bar (2-7), 27. Rosemead (2-7), 28. Ganesha (3-6), 29. Wilson (0-8), 30. Walnut (0-9), 31. Baseett (0-9), 32. Gladstone (0-9). LA Times had a big article on Nevins and his lack of D1 offers. This kid has the right tools but clearly the D! scouts feel something is missing. JUCO may be the route he has to go to prove his worth and luckily for him the top program in the US. is next door. He has 4 offers . The article was about the lack of big offers and so little offers . Switching gears for a second, RIP to one of our local hs baseball greats, Ricky Magdaleno who passed away last night. Much to young. Love you bro, you’ll be missed. South El Monte, Nogales, Arroyo, Duarte, Covina, Baldwin Park and Northview ranked above my Bearcats? Enuf said. Fred, like Bishop Amat, both Charter Oak & Damien should be ranked higher than Northview based on their game schedules! Charter Oak could say something due to the head to head. SB — It would be possible for a team to finish second in their league and get a #1 seed in the playoffs. Since a team is placed into a playoff division based upon their two previous seasons their placement might not be a true accurate indication of a team’s current level. A team must qualify for the playoffs (finishing in the top half of league) to participate. A school can be ranked very highly in their playoff division and fail to make the playoffs. I agree with the top three. 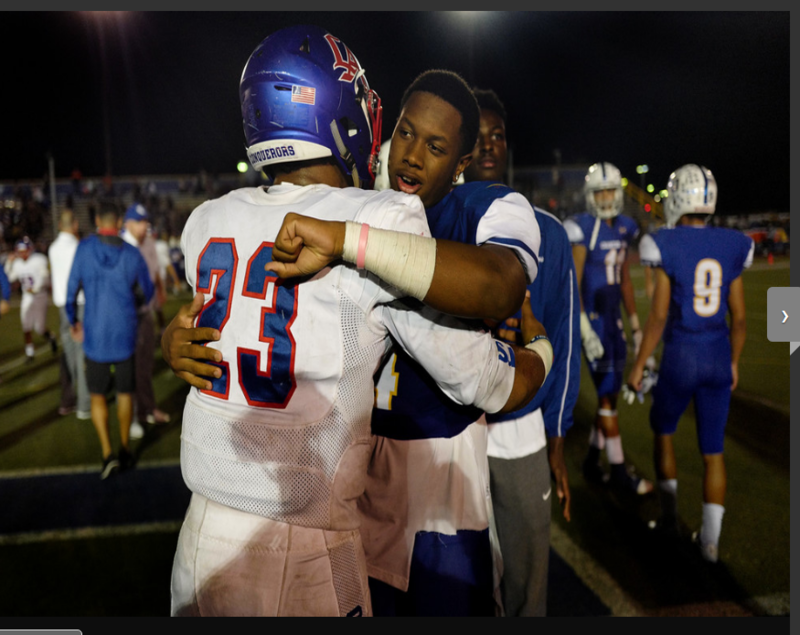 Los Altos has been the most consistent team week after week and might be the best team in the area. They have a running game as well as a passing game, and arguably the best defense in the area. They have a tough road game this week against West Covina that has serious playoff implications. If they win they most likely enter the playoffs as the number one seed. If they lose they most likely fall from the top three and would have to play a tougher team in the first round. So you think LOS AL would be 9-0 if they had Amat’s schedule? Or if they played in the Baseline league, would they still be 9-0? Teams play who they are suppose to play. Los Altos does not have the decision to say this year they want to play in the baseline or in the trinity league. So why knock off a team for having a great season. Maybe the would not be 9-0 if they were in the baseline, but guess what they beat Charter Oak so they probably would have a better than Damien anyway. My point is they have been the most consistent team week in and week out and deserve the number one spot. WC is a tough road game ? LA would go 2-8, maybe 3-7 against A mats schedule…and you know it ! Well they do not play Amats schedule. So we do not know what their record would be. All I see is a team that is 9-0 and has been playing great football. At the end what matter is what you do in the post season. What is the point of going 10-0 in the regular season and not win a championship. But what I do know and I am sure you know as well is that LA has a much better chance of winning a CIF championship than Amat. Nogales has a great shot at winning a ring too….it’s insanity to believe LA ıs the best team in the SGV….are you insane ? or just uninformed,naive? It definitely isn’t insane to believe actually. What does Amat have that Los Altos does not. Break it down for me please? Last time I checked they have the best defense in the area as well as the best running back in the area. Probably the best kicker in the area as well. So what makes it so impossible for Los Altos to beat Amat at this moment? You can not use the fact that they play better competition because if that is the case then why play Division 1 football when you cant beat a Loyola team that has lost this season to Division 3 teams? My point is that it is naive and ignorant to not consider Los Altos the best team at the moment. said the blind man….sheesh.. Mt Union Dlll has better stats than Bama…. wake up doof us…Do vs D six….why have divisions then fantasy boy ? Du you think LA is second in the SGV and do you realize until this year, there were teams in the highest divisions who never made the playoff? Many of whom this LA team would beat? I actually agree that Los Al has a much better chance at winning a ring than Amat and Damien. My comment was strictly based on who is the number one team in the SGV. LOS Al is having a great season for them and their division, but the best team in the valley is still Amat, who would handily beat Los Al. By the way, I did go to Amat. My stepson is a freshman at Damian, that’s why Damien Dad. Based on SOS Amat is the perpetual number one in the SGV. Be that as it may, Fred has made his case for his rankings time and time again. At least this year, two of the top area teams actually got to settle something on the field. I admire Amat for refusing any effort to move down in division due to pride, tradition, what have you. However, their chance for another title is on a far horizon. When LA won the Div.6 championship in 2003 it was just as fulfilling as winning the Big 5 in 76 or the AAAA in 73.